Todd Rundgren’s Play Like A Champion Concert: Students Play the ’80s at the University of Notre Dame, South Bend, Indiana, September 7. Concert by Todd Rundgren, backed by his full band and with appearances by Notre Dame student musicians. For the SOHF photo album by Jim Snyder, please click here. For the Notre Dame photo album, please click here. 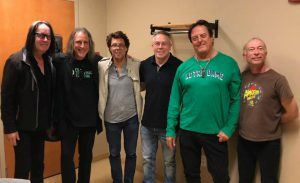 TR@ND 2018 “Dream Team”: Todd Rundgren, Jesse Gresse, Kasim Sulton, ND’s Ted Mandell, Prairie Prince, and Greg Hawkes. For videos and photos of TR@ND 2o16, please click here. For Big Weekend 2018 merchandise, please click here.